Review: Dragon slayers, dragon sleighers, and a planet called Myrth. Twelve year-old Greg Hart could never slay a dragon, he would be lucky if he didn't lose a fight against one of the smaller girls at school. In How to Slay a Dragon, book one: The Journals of Myrth by Bill Allen, Greg is expected to do the unimaginable - save a planet. Greg Hart is a twelve year old boy who loves to write fantasy stories about himself. But when the people of a medieval planet called Myrth mistake him for a dragon slayer named Greghart, they believe he is going to slay a very large dragon named Ruuan. Greg is named in a prophecy, and prophecies have never been wrong. Until now. This is a nice novel illustrating how anyone can be a hero. The author use the slay/sleigh pun a few times throughout the novel. I rate this book a 9 out of 10. I read this book whenever I could find a spare moment. I think the characters are all very developed. Greg is also a very dynamic character. 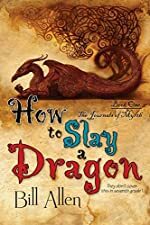 We would like to thank BelleBooks for providing a copy of How to Slay a Dragon for this review. Have you read How to Slay a Dragon? How would you rate it?